Art ++ is a new weekly Reads beat column published in the Thursday issue of The Daily. Each week, we will take a piece of art that is publicly available on campus and compare its resonances with another, completely different piece. We hope to draw attention to art on campus not usually found within the pages of this paper. I couldn’t help thinking of Buck Owens’s “The Streets of Bakersfield” (both the country song and the actual location) while observing Mary Weatherford’s 2017 “black painting” at the Anderson Collection. Like a faint memory of an old neon bar sign in the night, the painting’s effect balances the incision of an electric blue neon light against the murky, dark and aggressively smeared vinyl paint residue beneath it. The distant bittersweet twang of Owen’s guitar licks and the steady galloping rhythm of drum brushes on his track echo within the lyrical twang of Weatherford’s neon light and her shadowy gestural washes of black, brown, orange and blue paint, sharp and soft all at once like the best kind of country tune. The distant warmth and wistful longing of both works recall the nostalgia of a lonely cowboy, a sensibility that sometimes strikes you while staring into the sky on a warm summer Bakersfield evening, feeling like a wandering Hank Williams of the modern era. It is not altogether arbitrary to draw connections between Weatherford and Bakersfield, considering her 2012 residency at California State University Bakersfield, during which she first produced a widely acclaimed series of massive, expressionistic neon-laced paintings that signaled a major breakthrough in her career. As testament to her success in the central valley, her 2017 “black painting” now hangs in the Anderson Collection here at Stanford. 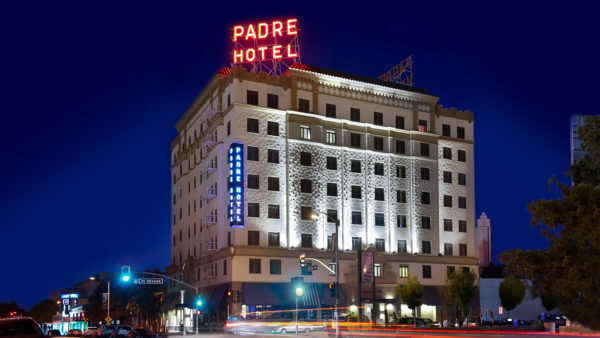 Perhaps it was evening in downtown Bakersfield when she arrived, and as dusk set in and the sunset gave way to indigo night, she noticed the blood red glow of a neon sign reading “PADRE HOTEL” against the darkness. Maybe, at that moment, a nascent realization flickered in her head. Hypotheticals aside, Weatherford’s work radiates with resonances of the distinctive, arid central California landscape in which Bakersfield rests. Plastic coated wires gracefully droop from the ends of her neon tubing, fading into the painting like endless power lines reaching into the darkening horizon of a receding sunset. Her washy, sweeping handling of paint evokes both the vast western night sky and the slippery, muddied blackness of the oil that courses beneath Bakersfield’s surface, a comprehensive indication of the landscape’s variety and a subtle reminder of its industries. The blue neon, sharp yet feeble against the looming surface of the painting, suggests something of how the urban, and perhaps the human, may factor into and struggle against a land such as this. Weatherford staunchly refers to her pieces as “pictures of places” rather than “paintings” or “landscapes.” This is an acutely intentional distinction. She foregoes a total fascination with the naturalistic purity of land in favor of an experiential approach to place, and so in “black painting” one can feel equally the presence of the natural sublime and the jangling honky tonk spirit of Buck Owens. The acknowledgement of both place and one’s invested relationship to it recalls the inherited human history and culture of a landscape, and Weatherford is certainly no stranger to the abundance of both in Bakersfield. During her residency there, she learned of “The Grapes of Wrath” and of oil rigs, of the wayward children of the Dust Bowl, of the photographer Dorothea Lange and of the country legend Buck Owens himself, all inescapable parts of Bakersfield’s sensibility that implicitly shape its daily life. She studied the endless valley and the varied fields, the vast gradient sunset, the aging buildings and bars of historic downtown and their glowing neon signs. She worked to understand Bakersfield as both a sedimentary repository of collective memory and a dynamic, living geographic space. These qualities are reflected in the murky translucence and imposing physical presence of “black painting,” in which each wash of paint laps over the other like the disparate and loosely converging memories of a place once held dear. A tangible jolt, the neon indicates the material immediacy of place that redeems the picture from being subsumed fully into its own dark pool of revery. Ever walked the streets of Bakersfield? Owens’s song concerns experience in the same way as Weatherford’s painting, both asking their beholders to suspend immediate judgement and “walk their streets” for just a moment. Rather than just passing through (a phrase most of my Californian friends have used to politely but dismissively describe their interactions with Bakersfield), experiencing Weatherford’s work requires you to consider the entirety of place more carefully, and provokes complicated meditations of the nature of our relationships to places as they are augmented and muddied by our histories and memories. To take on the experience of a place, as Owens notes in his song, wears blisters on your heels. It isn’t always comfortable or idyllic. But I’ll stand to argue, bolstered by the experience offered through Weatherford’s “black painting,” that a blistered heel is worth where its journey can take you. Contact Ali Vaughan at avaugha2 ‘at’ stanford.edu.